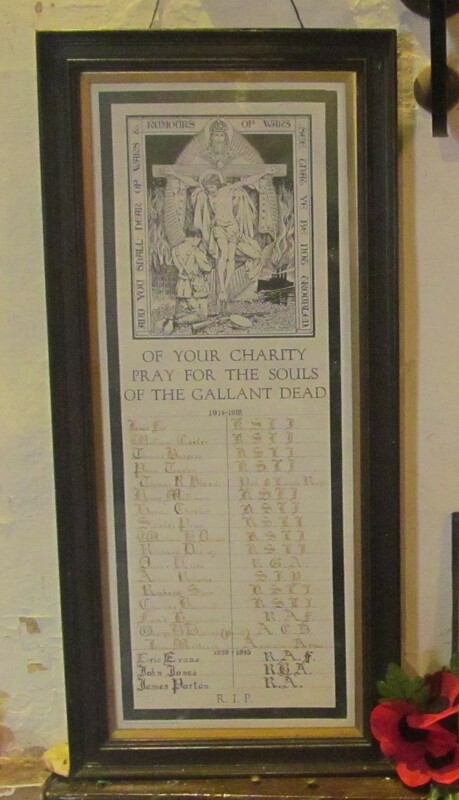 The Roll of Honour in the parish church of St Mary, Leebotwood, Shropshire, is something of a curiosity. 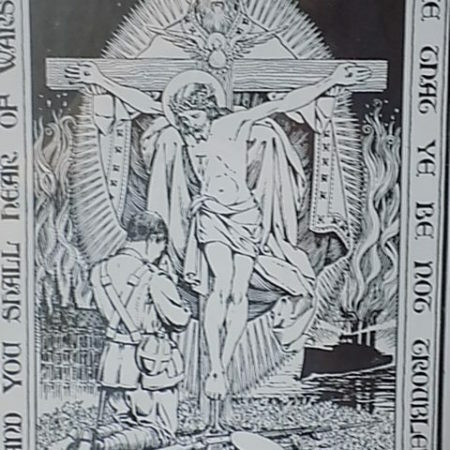 The wording – ‘Of your charity, pray for the souls of the gallant dead’ – is openly and intensely Catholic. 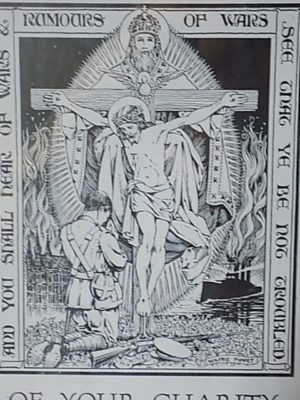 So is the image, a soldier praying before a very medieval depiction of the Trinity with God the Father cradling his crucified son and the Holy Ghost hovering before them. It was a representation of the Trinity that the Reformers particularly disliked, and it is very unusual to find it in an Anglican context. 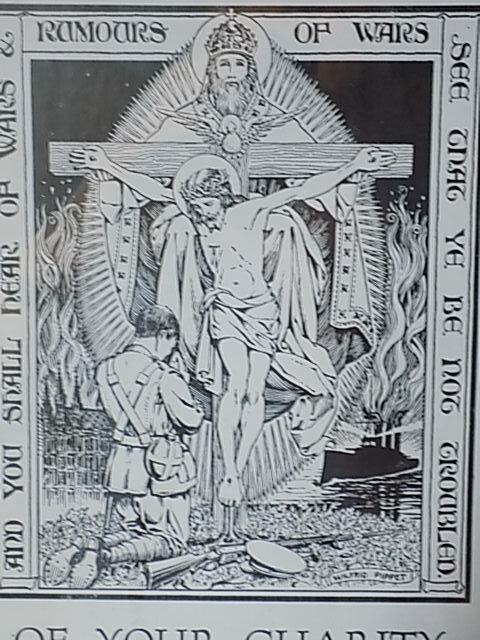 The First World War did result in some blurring of confessional boundaries – it did for example revive the tradition of prayer for the dead in the Anglican communion – but this would have been going too far for many people. So who was responsible for this design? 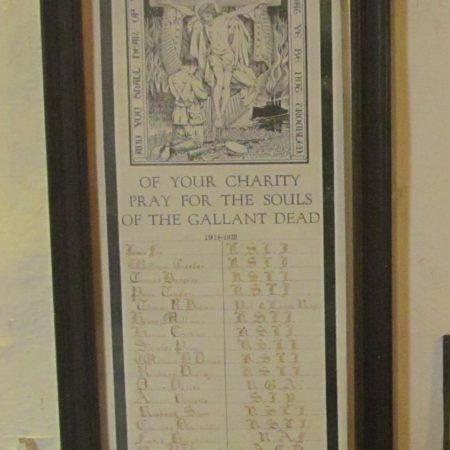 According to Phil Hellin, who sent us the photographs, the church is really a glorified mausoleum to the powerful Corbett family who lived at nearby Longnor Hall. There is though no suggestion that the Corbetts were Catholic – in fact they seem to have belonged to the resolutely anti-Catholic tradition in C19 politics. The design may simply have been the responsibility of the artist, Wilfrid Pippet of the famous Pippet family of artists. Pippet is best known for his interests in tarot and Rosicrucianism . He provided the reconstruction drawings of saints for Bond & Cam’s Roodscreens and Roodlofts and was clearly immersed in that rather Arts-and-Crafts take on later medieval iconography: was that what inspired his design for Leebotwood? The village also has a stone memorial in the churchyard with a Celtic cross. Both are on the Imperial War Museum database at https://www.iwm.org.uk/search/global?query=leebotwood&pageSize= .